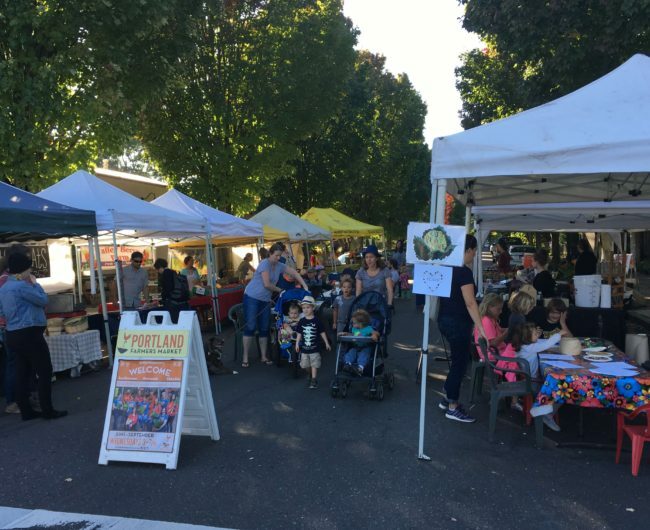 The Kenton Farmers Market is located in the heart of the historic Kenton neighborhood in North Portland. Founded in 2012, the market’s live music and the festive street-fair atmosphere thrive among this growing business district. Proximity to a MAX station and easy access for bicyclists and those on foot make this market a lively and convenient mid-week destination for fresh, local food. Friendly pets are welcome. Please keep your pet under control, away from food, and always clean up after your pet. Thank you! This market accepts: cash, credit cards, SNAP, WIC and Senior Farm Direct vouchers, Veggie Prescriptions, and Sisters of the Road Fresh Change. SNAP shoppers can receive Double Up Food Bucks, up to $10 per day. Market Music: Join us for live music at our music stage each week from 4-7pm. Visit our Events Calendar for more information. Kids Activities: Find food-focused activities for kids at the Kenton Market throughout the season. Activities will vary, and focus on getting kids excited about eating seasonal fruits & veggies. Food Demonstrations: How about a family-friendly Berry Bash or a Tomato Celebration!? Join us for food demonstrations and festivities throughout the season. Visit the Events Calendar for more information! The Kenton Market is located at N McClellan Street and Denver Avenue in North Portland. This market is easily accessible via Trimet. The Interstate MAX stop and several bus routes provide service just a block or two of the market. Plenty of free on-street parking and bike parking is available. Grupo Latitudes is music from the Andes & Latin Folk from Salvadorian Composer Tito Amaya. We will bring diversity, happiness and peace with the Latin Folk musical instruments and history, beat and singing!